As sovereign Beings on a planet that allows free will, we have the special ability to create reality. The powers of our mind, emotion and imagination, harnessed through the will are powerful enough to create reality. The architects of society know this amazing ability of the human will in unifying the creative forces and bringing reality into form. They understand this power of free will and have mastered the art of creating consensus, and manipulating humanities emotions to create their version of reality. They have created systems which we enter and unknowingly consent to. When enough people agree on certain beliefs, their creative forces unite and make it real. The living environments and social structures are designed specifically to harness every aspect of our free will to create a collective ideology. Before we are even born, our life trajectory is already set by virtue of the system we enter.As a baby, our parents are custodians of our free will and they, being already conditioned, give our rights over to the system. We come into a world that is predesigned with its city walls, building structures, city plans, hospitals, healthcare systems, money systems, government systems, military systems and school systems. Within these structures we have to find our place and find success. In becoming successful we learn how to play the game. In this card, the master architect is designing and creating the game board for everyone to play in. Through the layout of the roads and sections of the city, he sets up areas of association and areas of distance. He uses the energy of the lay lines of the land to create centers of power for leadership and areas of productivity for the workers. He sections off areas of beauty for the wealthy and areas of degeneration for the servants. In this way the societal hierarchy is built into the map. Generations of families will live and work out the scenarios of this orchestration. The inhabitants will be born into this schemata, grow up into it, play out their role and also die in it until they learn to master the energies of the game. When they do, they will then be able to pull their vested energies out of the systems of the game and form their own system; one that is in alliance with their Soul’s expression and earth’s energies. We are ultimately meant to create our own version of reality and share it with those who belong to it. But before you discover your own roots, you learn to live, grow and thrive using the roots given to you by society. In this card you have reached a certain level of mastery on which you can rely on. You have found your place in society. You have mastered your craft and have found stability through it. 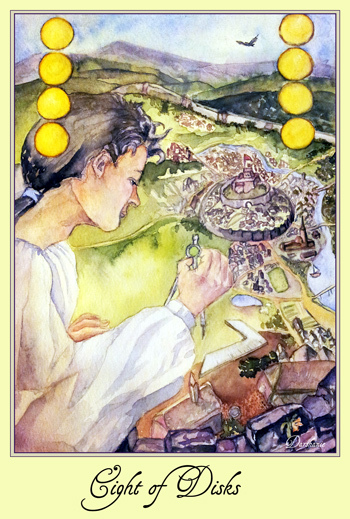 This card represents masculine power that structures the world, and creates boundaries, rules and laws. When you pick this card, look at your environment and see how it influences you. Acknowledge your level of mastery in the game of society. See where you benefit from it and where you would like to reclaim your power. Learn about your environment and make it work for you. 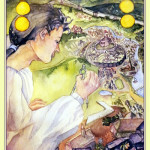 This entry was posted in Disks, Tarot on December 27, 2015 by darshanie.